When: From a time when all ladies wore slips...eons ago that must be. 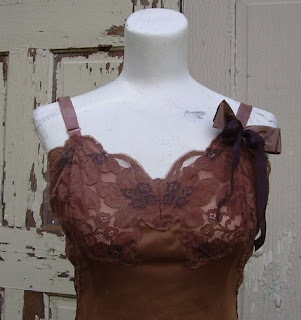 I think a dyed vintage slip would be perfect for all those sheer tops summer calls for. Hey ya'll! Tell me you saw me here and I will include a free duct tape cabbage rose brooch with your order. Thanks so much for the feature. I do what I love and I love what I do. Merrill rocks and puts a lot into her work.